What are the Best Brake Pads Today? Brake pads are among the most vital components of disc brakes utilized in automotive, as well as other applications. They also refer to steel backing plates that come with friction material attached to the surface – facing the brake rotor. They are vital parts in a brake because they contact and apply friction and pressure into the brake rotors of your vehicle. Such rotors refer to the shiny and flat discs that you see behind your vehicle’s wheels. The applied friction and pressure into the rotor works in slowing down and stopping the wheel. If the wheel stops turning, then you can expect your car to stop moving, as well. Brake pads work by converting the kinetic energy of your car into thermal energy through the application of friction. When it comes in contact with a rotor, you can expect it to heat up then transmit small amounts of friction material into the disc. This process turns it into a dull gray. You can then expect both the brake pad as well as the disc to stick to each other. Such aids in giving the kind of friction needed to stop your vehicle. Brake pads require regular replacement based on the material mainly used in them. Most of these products also feature a method designed to alert you in case you need to replace them. Some models, for instance, come with a tiny central groove, which will disappear eventually through wear. If that happens, you’ll know that it’s time to replace the pad as it is already close to ending its service life. Other models, on the other hand, have thin strips of soft metals positioned similarly. Their exposure to wear can cause the audible squealing of the brakes. That said, you’ll know exactly when it is already time to replace the brake pads. If yours are already in need of a replacement, then check out the following products as these are known to be among the best in the category. Wagner ThermoQuiet QC465A Ceramic Disc Pad Set is ideal for you if you’re planning to replace worn out and old brake pads. It features a single-piece design, which works in dissipating heat and dampening noise. Mainly made out of ceramic material, you can expect this set to provide impressive stopping power, as well as reduced vibration. It is a high-quality product offered at a low price. It specifically makes use of the integrally molded sound insulator, which is exclusive to the brand. This feature aids in dissipating heat and vibration, thereby promoting a more silent braking. Furthermore, it has proprietary friction formulations designed to offer excellent stopping performance with minimal dust. Aside from its consistently satisfactory performance and ability to produce lest dust, you can also expect the pad to have a longer life. It has a comprehensive coverage ideal for both domestic and foreign vehicle applications. Moreover, it makes use of the EDGE laser-shaped friction technology, which is a huge help in further boosting its performance. The fact that it is one of the offered products of Wagner, a reliable manufacturer, also provides some sort of assurance that the product is one of the best brake pads there is. There are some problems in this brake pad, though, as noted by some of its users. For one, it does not seem to fit all types of vehicles. There were instances when users reported pads outside of the rotor to be too long while having smaller ends that don’t seem to fit. There is also a tendency for the pads to crack within just a few hundred miles. Also, you may notice that the pads are thinner than what you initially expected. 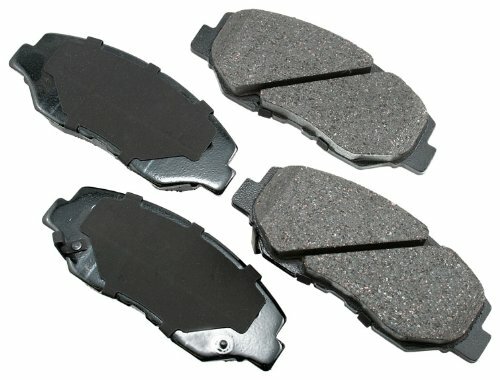 This brake pad set is an excellent choice in your search for the best pad to replace your old one. 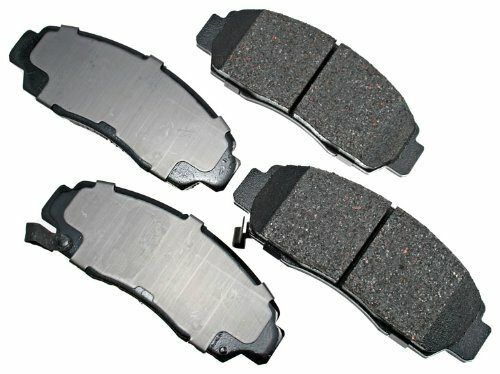 This ceramic brake pad set from Akebono is reliable as it uses the most carefully chosen materials. Such materials also work efficiently in minimizing and eliminating unwanted brake dust. That said, the brake pad can deliver smooth stopping power consistently across various driving conditions and situations including panic stops. But there are some drawbacks to this product, so you have to prepare yourself for it for you to have an easier time managing them. One is the confusing product details that may cause you to buy the wrong set. That said, a wise advice is to determine the exact pads you need before making your final order. The pads are also a bit soft, and they don’t have the same grab offered by factory pads. They also tend to produce some squeaking noises when wet. Despite such drawbacks, you can still expect to get real value for the amount you spent for it because it has several useful functions and features. Constructed based on Original Equipment (OE) standards, rest assured that this brake pad can offer you the ultimate experience no matter what kind of motorist you are. It makes use of vehicle-optimized friction formulations – all of which can help get rid of noise, vibration as well as harshness, while also restricting wheel dust. It is also a huge help in improving its durability while also promoting smooth braking situations. The product is ideal for you if you’re planning to restore OE ceramic performance or upgrade from the conventional pad. It also makes use of various Pro-ACT Ceramic formulations designed to lessen or eliminate squealing, vibrations and groaning in the brakes. It’s also possible to experience low dusting because it is compatible with the modern aluminum open-wheel designs. 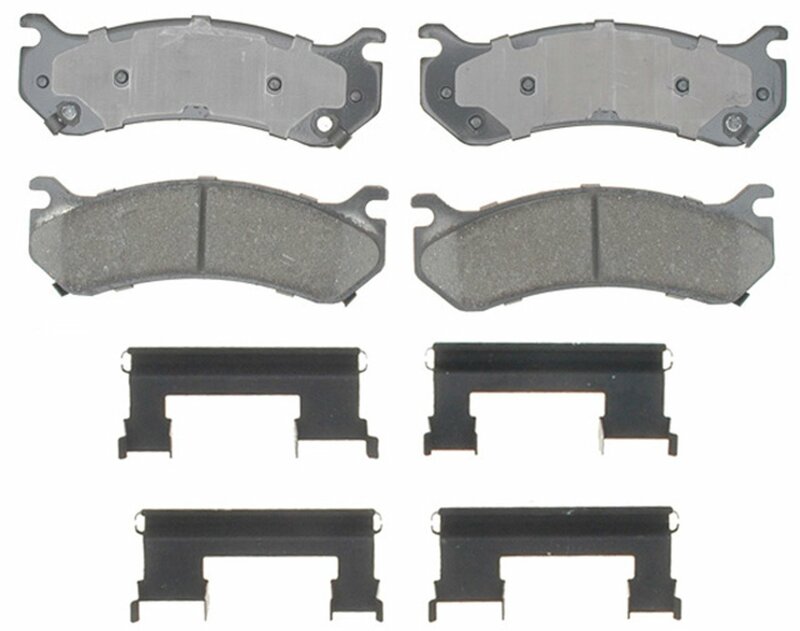 One thing that makes the 17D785CH Professional Ceramic Front Disc Brake Pad Set from ACDelco amazing is the fact that its manufacturers made it in such a way that it can resist premature wear as well as corrosion. This choice is ideal if you’re planning to make the necessary replacement for non-GM and GM vehicles. The good thing about this brake pad set is that aside from performing exceptionally, it also comes with noise-dampening shims, promoting a quiet operation. However, note that there are problems in the product, such as the fact that it does not fit nicely on some vehicles. Some users also reported that it starts to squeak badly after a few weeks of installing it. The squeaking tends to be apparent in both light and moderate stops. Other than those mentioned issues, though, this ceramic brake pad set from ACDelco works just fine. It has the right form and function you expect from the brand. It has a durable ceramic formulation, which makes use of less metal while also giving the brake pad higher quality braking power. Also, there is no need for any modification or curing. You can install it right after taking its parts out of the box. Aside from ceramic, it also makes use of organic and semi-metallic formulas capable of providing a reliable and safe solution for various vehicle applications. With the friction material molded into the backing plate, it’s also safe to expect higher bond integrity. The high-quality shims, chamfers, and slots integrated into the set also aid in minimizing noise, harshness in the brakes and vibration. Moreover, you will love the stamped backing plate of the set. It supports proper pad movement while also minimizing brake pulsations and noise. Also, it works in protecting the pads from premature wear. The ACT787 ProACT Ultra-premium Brake Pad Set from Akebono is a nice option primarily because of its flexibility. It is flexible enough that it can meet the needs of the majority of motorists. It has vehicle optimized friction formulations that aim to get rid of harshness, vibration, and noise once it starts to operate. These formulations also hugely help in restricting wheel dust. You can expect it to be highly effective at first tries without the need for any break-in period. But just like other brake pad sets in the market, this model from Akebono is also imperfect. It has its set of flaws, as well. One flaw is that it seems to produce heavy brake dust during your initial users but rest assured that this will eventually subside. Furthermore, it has a slightly less initial bite when compared to OEM. During the first few applications, it also tends to produce an awful smell, but this will eventually wear off with a few more uses. Yes, there are issues with this ceramic brake pad set from Akebono, but you will never regret buying it because it also has several valuable functions and features. One thing that you’ll be thankful for about this product is the fact that it is extremely rotor-friendly. This benefit is a good thing because it also lengthens the life of the rotor. The vehicle optimized ceramic formula used in this brake pad set also further improves its performance. It operates quietly because of the integration of its unique set of Pro-ACT Ceramic formulations – all of which aids in lessening or completely getting rid of noise including vibrations, squeals, and groans. Furthermore, it is more durable and flexible. It works well for various types of motorists while also ensuring users that it has high pad wear performance. In other words, it is safe to assume that it has longer periods in between brake jobs. 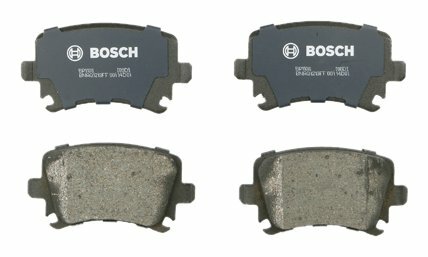 Bosch commits to providing its clients with high-quality products that can give them ultimate satisfaction, and such is what you can expect from its BP1108 QuietCast Premium Disc Brake Pad Set. This model works ideally for all models and makes, so it is no longer surprising why many people say that it brings the aftermarket brake pad technology into an even higher level. The brake pad set guarantees not only a quiet operation but also excellent stopping power. There are problems in this brake pad set that you have to take note of, though. One is that it does not work well for rear brake calipers as it is too short. Also, it tends to produce some brake dust. Those are just minor flaws those that its impressive features and benefits can easily overpower. For instance, it comes with an OE style multi-layer shim design. This design increases its strength and insulation, making it more efficient in handling noise. Furthermore, it features OE-designed chamfers and slots that improve not only its quality but also its fit and function. It also promotes top quality availability, reasonable pricing, as well as comprehensive coverage of all the models and makes of various automobiles, SUVs, and light trucks. Some of the formulations that you can expect from this brake pad set are semi-metallic, platform-specific ceramic, as well as non-asbestos organic. Also, the sound vibrations will tend to pass through the backing plate and friction material while promoting proper dissipation with the distinctive rubber core that you can find in the shim. Such further improves the ability of the product to dampen noise. Also featured in the product is the protective transfer layer, which you can find on the pad surface and rotor. This aids in extending the life of both the rotor and the pad. Created as alternatives to asbestos pads and contain different fibers combined with binding resins that aid in keeping them together. One of the benefits of this type is that it is soft and easy on brake rotors. It does not also need a lot of heat to produce good friction. Also, it has less dust and low cost of manufacturing. It works ideally for normal commuting and driving activities across multiple environments. 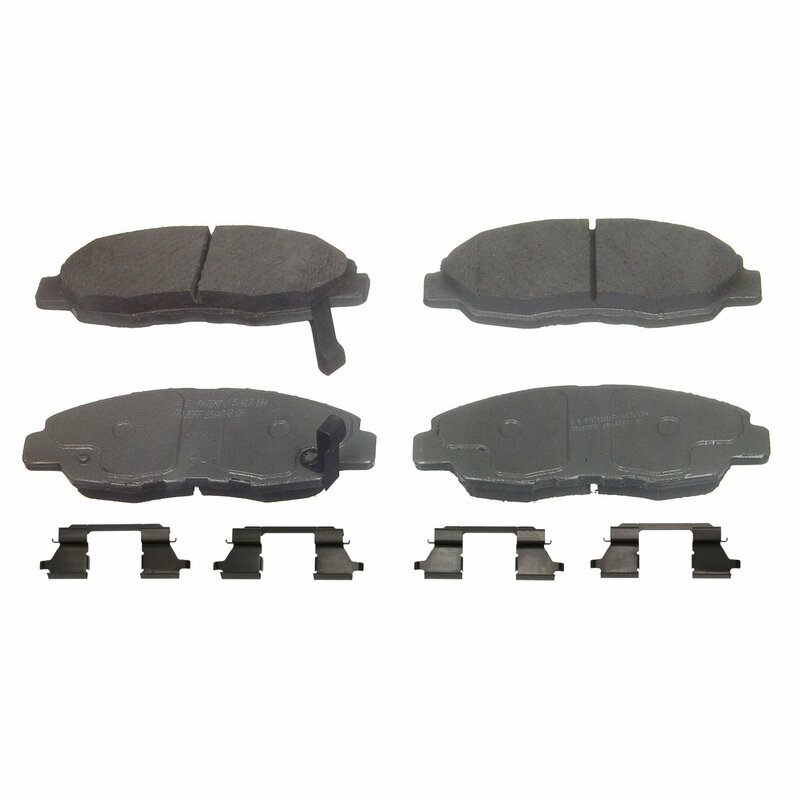 ​This brake pad consists of around 30 to 65% metal, usually composed of iron, steel or copper. It is the most flexible type available but with few drawbacks like the fact that it produces more dust and noise. Semi-metallic brake pads are also more durable, so expect them to last long. The fact that it has strong metallic composition also aids in drawing heat away from the rotor. Such improves its efficiency to keep the brakes cool. ​These pads consist of dense ceramic material, such as pottery fired in a kiln then combined with copper fibers. They produce less noise and dust plus are easier on rotors when compared to the semi-metallic type. The brake dust it creates is finer and has a lighter color, so there is no need to worry about it sticking to dust. You’ll also enjoy the fact that this type has a long lifespan. It is stable enough to work at various temperatures and delivers a highly consistent performance. ​Keep in mind that all brakes require a soft friction material connected to a sturdy metal backing plate. In this case, you have two options – the bonded and the riveted friction material. Many prefer the bonded material as it tends to help in making the brakes last a bit longer. ​Note that when the friction material wears down, there is a great chance for the rivet to come in contact with the rotors or drums. This further triggers squealing sounds when almost worn out. Once this happens, you’ll need to replace the brakes instantly. ​Take into full consideration your driving requirements. Determine the level of severity of your braking requirements. Few points to consider are the climate in the place you’re living, traffic patterns, your ability to tolerate brakes that tend to squeal too much, and how mountainous your driving is. Such points can help you determine your driving needs, thereby making it easier for you to find the most suitable brake pad for you. ​It is also advisable to check the temperature rating before making your choice. Look for a pad, which can function at the precise temperature reached on track. Also, it should not let the brakes once they reach operating temperatures. If you’re planning to use it for drag racing, high-horsepower street performance, or dirt track applications, then look for one with a temperature rating of around 500-1,000 degrees Fahrenheit. ​Of course, you need to check the reputation of the brands of brake pads you intend to buy. Go for proven brands only. Doing such is more important, especially if you intend to use a pad for towing or racing. Note that in these cases, any failure or malfunction in the brakes can instantly result in disaster. While going for high-quality brands almost automatically requires you to spend more, you also have an assurance that you’ll get what you pay for when it comes to performance. ​It is necessary to spending time reviewing the entire brake system when planning to replace brake pads. Doing the review is even more vital, especially if you plan to do the repairs yourself. Another tip is to ensure that you flush the old fluid in the hydraulic system, especially if your truck or vehicle is already more than eight years old. Doing this is essential in maintaining low moisture levels while also ensuring that the brakes function at their peak. ​It’s also essential to set a budget before buying a brake pad. Doing this will help you narrow down your choices, making it easier for you to look for a brand and model, which fits your budget while still meeting your standards and requirements. ​When searching for the best brake pads, note that it is never a good idea to go for the cheapest option. Note that you need to check the quality, features, functionality and performance before making your choice. You need to find a high-quality brake pad as this can help you have a quick and smooth stop while also saving lives.